Can a Multigenerational Workforce be a Collaboration Sandbox? You are here: Home / Human Capital & Industrial IoT Workforce / Can a Multigenerational Workforce be a Collaboration Sandbox? The multigenerational workforce is a workplace reality. Unless, of course, you are a workplace hermit. And, let’s face it. The composition of any workforce impacts the dynamics of the workplace, for better or for worse. So, why not focus on creating opportunities, or sandboxes, in which workforce teams can become more collaborative? 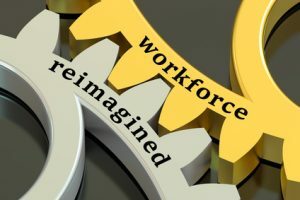 A workforce reimagined? The goal for today’s, tomorrow’s and the future’s workplaces is not only engaging the multigenerational workforce. Also, the goal is creating an engaged, collaborative and innovative workforce. Because, engagement for engagement’s sake is, well, self-serving. However, when employee engagement becomes customer-focused and collaborative, teams create extraordinary and enduring client outcomes. The type of client outcomes which fuel loyalty and customer retention. Consequently, the multigenerational workforce offers organizations a tremendous opportunity for innovation. However, creating that type of collaborative workforce still remains an organization’s biggest challenge. I have had the good fortune of participating in some tremendously collaborative, multigenerational workforce teams. And yes, I have been on some total disasters, as well. What is your own professional experience with both of these types of teams? While plenty of blog posts are written about toxic teams and workplaces, let’s not dwell on the negative here. Because when we retain experiential memory of the great teams we have been part of, we carry our collaborative sandbox experiences forward. Then, we encourage the next team we work with to become a sandbox in which everyone becomes better and better, as well. I collaborated with some amazing teams who were able to throw away the historical workplace baggage and bias which keeps teams at each other’s throats. As a result, they did not judge any books (team members) by their initial- or subsequent – covers. Instead, these teams considered everyone as someone “new,” whom they never had met before (even if they had). The net effect was magic. Even while working within command-control, siloed corporate cultures. At meetings, everyone always had something powerful to contribute. Regardless of job function, level of education, gender, ethnicity, generationalism and all “those” attributes which separate people and reinforce Us versus Them mindset. Let’s face it, when we continuously keep score and find justification for why we should not collaborate across departmental silos, our organizations remain good and stuck and complacent. Looking for a dynamic speaker for a keynote or workshop focused on overcoming professional intimidation and Us versus Them workplace mindset? Contact me today to discuss your next event or association meeting needs. The Bigger Issue we face today is when a multigenerational workforce fosters unconscious (and implicit) workplace bias. How would you describe your own workforce? Start by uncovering pockets of multigenerationalism. And every other form of unconscious bias, as well. We cannot ignore that a multi-generational workforce is an evolutionary given. Our challenge, as Professionals of Worth, is leveraging multigenerational collaboration, focused on driving revenue and creating enduring value. Otherwise, the full value of a team is under-utilized. Then, liberate pockets of “undiscovered” value. Discover when, where, how and why employees are marginalized and excluded because of perceived shortcomings (including lack of generational credibility and level of education). Otherwise, Quality, engineering, IT, HR and other disciplines remain perceived as just another organizational line item and cost center. Finally, connect the dots of the value continuum. After all, continuously addressing these issues is part of creating – and executing – a rock-solid human capital strategy: one which leverages the value of a productive, profitable, collaborative, diverse and inclusive workforce. What are you waiting for? Start moving one millimeter beyond your workforce’s comfort level, today. Has what you read Today started you Thinking about tomorrow? Contact me. Let’s create a One Millimeter Mindset™ program that fits your needs. Babette Ten Haken, Founder & President of One Millimeter Mindset™, is an innovative speaker, strategist, and storyteller. Babette’s One Millimeter Mindset™ Workshops and Speaking programs leverage collaboration to catalyze professional innovation, workforce engagement and customer retention. Babette’s playbook of collaboration tools, Do YOU Mean Business?, is available on Amazon. She is a member of SME, ASQ, SHRM and the National Speakers Association.